This is a regular blog post. Please check out the other posts for show notes and links to show audio. Vince Vaden probably didn’t think about what it was like to try to breathe with a refrigerator on his chest unless it was to empathize with a victim of an accident or fire that he might rescue. He probably didn’t think a lot about jet fuel, either, unless it was as part of his hazardous materials and disaster management training. That’s because Vince is a critical care paramedic and certified firefighter. Most of the time, he’s thinking about other people instead of himself. But today, Vince got to think about pulling G-loads similar to having a refrigerator on his chest or burning thousands of pounds of JP-8. 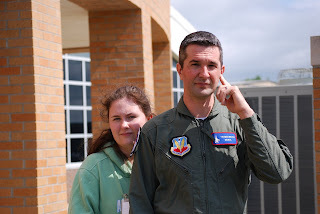 He got a ride with the United States Air Force Air Demonstration Squadron, the Thunderbirds. 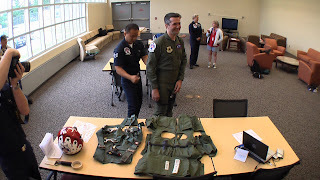 Vince was nominated and selected as a Hometown Hero and given the opportunity to go fly a one-hour demo with LtCol Derek Routt, Thunderbird 7. Vince started out as a first responder by earning his EMT-Basic license. He became a paramedic just two years later. From 1999 to 2004, he also served as a firefighter for LeRoy Township near Battle Creek. He’s now a critical care paramedic, which is the top of the paramedic ladder. He’s qualified to transport critically ill and injured people between hospitals, frequently as the highest medically-qualified person on the transport mission. 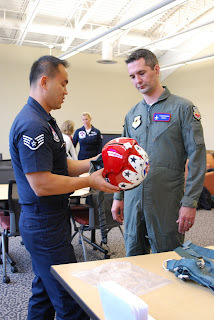 The Thunderbirds’ Hometown Hero program complements the Thunderbirds’ existing media flight program in raising public awareness of the Air Force’s capabilities while also giving back to the individuals who patiently and quietly protect and take care of us all over the country. 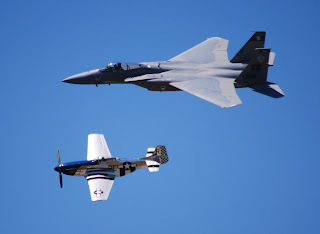 The program showcases American people who do amazing things in their communities, bust as the airmen of the US Air Force to amazing things in the skies at shows like the Battle Creek Field of Flight Airshow and Balloon Festival. I got to hang out with Vince while he suited up. He was pretty focused on the process as they patched him up, fitted him for the G-suit, and set up his helmet and oxygen mask. His wife and nine-year-old son are delightful and seemed really excited for him. They were out on the ramp for the arrival of the team and I talked to Vince briefly. He said the kinds of things that I would imagine I said when I was in his boots (perhaps even the very same boots) and seemed pretty preoccupied with realizing the dream. I had to leave to get to the balloon gathering to see if there was going to be a launch. They scrubbed it, probably for both low ceilings and wind. I had a feeling that they might scrub it, but wanted to get back to see about available media slots and maybe see Dave Emmert, who took me up in 2006. At about 6:30, Thunderbird 7 roared down Runway 23 and took to the sky. Because of the low cloud layer, they didn’t do the vertical pull at the end of the runway, instead lifting off and making a tight right turn, entering the clouds level and climbing north for the Hersey MOA near Big Rapids. Congratulations, Vince! It was good to meet you. And it’s good to know that the Thunderbirds have recognized your patient and skillful service. And that you’re an inspiration to first responders and others who serve everywhere. Hope you enjoyed your flight, man! Smoke on! These are the show notes to an audio episode. You can listen online right here by clicking: http://media.libsyn.com/media/airspeed/AirspeedF-15Demo.mp3. 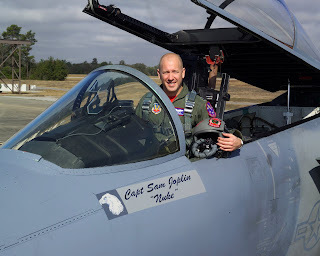 We interviewed Capt Sam “Nuke” Joplin of the F-15 West Demo Team on Sunday, July 6 from the Battle Creek Field of Flight Air Show and Balloon Festival. The F-15 West Coast Demo Team is one of the seven single aircraft demonstration teams assigned to the USAF Air Combat Command. The F-15 West Team originated from Holloman AFB in New Mexico and moved to Tyndall AFB in Florida before settling at Eglin AFB in the early 1990s. The name “West Coast” has been retained for heritage purposes. Capt Joplin spent some time talking about the return of the Eagle fleet to service after having been grounded for some time in 2007 and early 2008, as well as the operational capabilities of the aircraft, what it’s like to do heritage flights, how he received his callsign, and whether Eagle drivers read Air Force Blues. 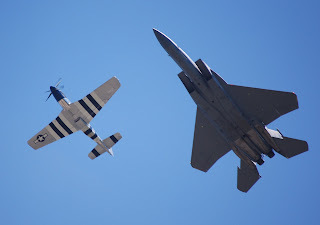 Here’s s shot of the F-15/P-51 heritage flight on Saturday, July 5 at Battle Creek this year. Another shot of the heritage flight as it passed over the crowd on Saturday.